Objectives The objectives of this study were to investigate if findings by intracoronary near-infrared spectroscopy (NIRS) and intravascular ultrasound (IVUS) are associated with future cardiovascular events and if NIRS can differentiate culprit from non-culprit segments in patients with coronary artery disease. Methods The study included 144 patients with coronary artery disease undergoing percutaneous coronary intervention and combined NIRS-IVUS imaging at two Swedish hospitals. The NIRS-derived lipid core burden index (LCBI), the 4 mm segment with maximum LCBI (MaxLCBI4mm) and the IVUS-derived maximum plaque burden (MaxPB) were analysed within the culprit segment and continuous 10 mm non-culprit segments of the index culprit vessels. The association with future major adverse cardiovascular and cerebrovascular events (MACCE), defined as all-cause mortality, acute coronary syndrome requiring revascularisation and cerebrovascular events during follow-up was evaluated using multivariable Cox regressions. A receiver operating characteristic (ROC) analysis was performed to test the ability of NIRS to discriminate culprit against non-culprit segments. Results A non-culprit maxLCBI4mm ≥400 (HR: 3.67, 95% CI 1.46 to 9.23, p=0.006) and a non-culprit LCBI ≥ median (HR: 3.08, 95% CI 1.11 to 8.56, p=0.031) were both significantly associated with MACCE, whereas a non-culprit MaxPB ≥70% (HR: 0.61, 95% CI 0.08 to 4.59, p=0.63) was not. The culprit segments had larger lipid cores compared with non-culprit segments (MaxLCBI4mm 425 vs 74, p<0.001), and the ROC analysis showed that NIRS can differentiate culprit against non-culprit segments (c-statistics: 0.85, 95% CI 0.81 to 0.89). Conclusion A maxLCBI4mm ≥400 and LCBI ≥ median, assessed by NIRS in non-culprit segments of a culprit artery, were significantly associated with patient-level MACCE. NIRS furthermore adequately discriminated culprit against non-culprit segments in patients with coronary disease. Intracoronary near-infrared spectroscopy (NIRS) is a catheter-based imaging modality developed and validated to detect coronary lipid-rich lesions in living humans, and recent studies have reported that NIRS may be useful to identify patients at risk for future cardiovascular events. This is the largest study yet to demonstrate a significant and independent association between NIRS-findings in non-culprit segments of an investigated culprit artery and future cardiovascular events. Our results support and substantiate knowledge from previous studies and demonstrate a case report of site-specific detection of a vulnerable plaque identified by NIRS. The results from this study support the hypothesis that NIRS imaging of the culprit artery during percutaneous coronary intervention may add valuable information regarding a patient’s coronary lipid burden and cardiovascular risk. Further research is warranted to confirm these findings and to evaluate the ability of NIRS to prospectively detect vulnerable plaques. Ischaemic heart disease is one of the leading causes of death worldwide, and patients with a history of myocardial infarction remain at an increased risk of future cardiovascular events, despite secondary preventive medications that are known to improve outcome.1 Hence, further research to improve the foreseeing of cardiovascular events is needed. As angiography has limited possibilities to detect vulnerable plaques, new intravascular imaging techniques have evolved. Intravascular ultrasound (IVUS) is a catheter-based imaging modality exploring the coronary vessel wall from the inside, and the ability of IVUS to identify high-risk plaques has previously been demonstrated in prospective studies.2–4 Intracoronary near-infrared spectroscopy (NIRS) is a novel intravascular imaging modality, developed and validated to detect atherosclerotic lipid-rich lesions within the coronary arteries in living humans.5–7 The NIRS analysis generates a lipid core burden index (LCBI) based on the amount of lipid in the investigated artery, and the 4 mm segment with maximum LCBI is known as the MaxLCBI4mm.7 Observational studies have reported NIRS-detected lipid-rich plaques at the majority of culprit sites in patients with acute coronary syndrome (ACS), and a MaxLCBI4mm ≥400 has been suggested to be a specific signature of plaques that underlie myocardial infarction.8–10 Given this knowledge, NIRS has been proposed to be a valuable tool in the search for the vulnerable plaques, and recent data have reported that NIRS may be useful for patient-level risk stratification.11–14 The ability of combined NIRS-IVUS to prospectively detect vulnerable plaques and foresee clinical events however still warrants further investigation, and the aim of this study was to investigate if combined NIRS-IVUS findings in non-culprit segments of a culprit vessel are associated with future cardiovascular events and if NIRS accurately can differentiate culprit from non-culprit segments in patients with coronary artery disease. Consecutive patients undergoing percutaneous coronary intervention and combined NIRS-IVUS imaging during an index coronary catheterisation at Skåne University Hospital, Lund, Sweden, and Danderyd Hospital, Stockholm, Sweden, between 2012 and 2015 were screened for inclusion in this study. Patients meeting the following inclusion criteria: age above 18 years, coronary catheterisation due to suspected ischaemic coronary disease and combined NIRS-IVUS imaging of the culprit segment and at least 10 mm of a non-culprit segment within a native coronary artery were retrospectively enrolled in this observational study. Patients referred to acute coronary artery bypass grafting (CABG) and patients without complete follow-up were excluded from further analysis. Combined NIRS-IVUS data were acquired using a 3.2 F coronary catheter (TVC Imaging System, Infraredx, Burlington, Massachusetts, USA), and the decision to perform combined NIRS-IVUS was made by the interventional cardiologist, and performed pre- and/or post-stent placement, in accordance with clinical IVUS guidelines.15 All NIRS-IVUS images included in the study were retrospectively analysed using either CAAS IntraVascular software (Pie Medical Imaging, Maastricht, The Netherlands) or the TVC imaging system consol (Infraredx, Burlington, Massachusetts, USA), blinded to patients’ characteristics and outcome. The culprit segment was identified in the combined NIRS-IVUS images by the corresponding angiography and defined as the region treated with balloon and/or stent placement during the index procedure. The remaining non-culprit regions of the investigated arteries were divided into 10 mm continuous non-culprit segments, excluding previously stented segments. All culprit and 10 mm non-culprit segments were analysed for LCBI, MaxLCBI4mm and the maximum plaque burden (MaxPB). The primary NIRS and IVUS findings were LCBI ≥ median, MaxLCBI4mm ≥400 and MaxPB ≥70%, based on knowledge from previous studies.2 11 12 The LCBI and MaxLCBI4mm were automatically provided by the NIRS-derived chemogram and the MaxPB was calculated by manual contouring of the external elastic membrane (EEM) and vessel lumen and defined as the area of plaque and media divided by EEM area.16 17 When combined NIRS-IVUS of the same coronary segments was performed both pre- and post-stent placement, the pre-stent imaging pullback was selected for the culprit analysis, and the post-stent imaging pullback was selected for the non-culprit follow-up analysis. Chemograms were considered uninterpretable and excluded if black areas, representing catheter artefacts and unreliable data, interfered the analyses. Baseline characteristics were registered at the time of the index catheterisation and enrolled in local NIRS-IVUS registries. The primary endpoint of major adverse cardiovascular and cerebrovascular event (MACCE) was defined as all-cause mortality, recurrent ACS requiring revascularisation and cerebrovascular events (transitory ischaemic attack or stroke) as in previous NIRS-IVUS studies. Recurrent events related to the index culprit lesion or previously stented segments were not included in the analyses. Follow-up was recorded from medical records with a minimum follow-up time of 1 year. Normally distributed continuous variables were presented as mean±SD, and non-normally distributed continuous variables were presented as median and IQR. Categorical variables were displayed using numbers and percentages. Differences between groups of patients with non-culprit LCBI ≥ median versus LCBI <median, a non-culprit MaxLCBI4mm ≥400 versus MaxLCBI4mm <400 and a non-culprit MaxPB ≥70% versus MaxPB <70% were assessed with the χ2 test for categorical variables and the Student’s t-test or Mann-Whitney U test for continuous variables, as appropriate. Univariable and multivariable analyses of the primary endpoint were done with Cox regression models, and Kaplan-Meier curves of MACCE were plotted and analysed with the log-rank test. The multivariable Cox regressions models were adjusted for age and gender, as decided a priori. The number of covariates included in the multivariable model was limited in order not to overfit the models. The proportionality assumption of Cox regression was tested. P values <0.05 were considered significant. Additional Cox regression analyses were performed: (1) with an endpoint including only cardiovascular deaths instead of all-cause mortality and (2) with an endpoint not encountering cerebrovascular events. Furthermore, different thresholds of MaxLCBI4mm and MaxPB were evaluated. A receiver operating characteristics (ROC) curve was constructed to evaluate the capacity of the NIRS-derived MaxLCBI4mm to discriminate the culprit segment against a background of non-culprit segments. Additionally, ROC curves including the subgroups of patients with (1) MI and (2) STEMI were constructed and the sensitivity and specificity of the previously described threshold of MaxLCBI4mm ≥400, previously confirmed to discriminate culprit against non-culprit segments in patients with ACS,9 was evaluated. Culprit lesions where combined NIRS-IVUS revealed stent thrombosis were not included in the culprit analysis due to its different mechanism of thrombosis. The statistical calculations were performed in SPSS Statistics V.24.0 and STATA V.14.2. Between July 2012 and January 2015, a total of 168 patients were enrolled in this study. Eight patients were excluded due to incomplete follow-up, two patients were referred to CABG and an additional 14 patients were excluded due to uninterpretable NIRS images (figure 1). The remaining 144 patients constitute the study population and consisted of 102 (70.8%) men, and the mean age was 66.5 years. The index procedure included 43.8% ST-elevation myocardial infarction (STEMI) (n=63), 24.3% non-STEMI (n=35), 13.9% unstable angina (n=20) and 18.1% stable angina (n=26). Investigated arteries were left anterior descending coronary artery in 66.0% (n=95), left circumflex coronary artery 12.5% (n=18) and right coronary artery 21.5% (n=31) and the median length of the investigated arteries was 60.0±21.1 mm. Flow chart of included and excluded patients. CABG, coronary artery bypass grafting; IVUS, intravascular ultrasound; NIRS, near-infrared spectroscopy. Baseline characteristics in relation to NIRS and IVUS findings are presented in table 1. The median non-culprit LCBI (based on the mean of all 10 mm non-culprit segments within each investigated artery) was 65, and patients with non-culprit LCBI≥65 were similar to the patients with non-culprit LCBI <65 regarding all baseline characteristics except hypertension, which was more common in the group with non-culprit LCBI <65 versus LCBI ≥65, 62.5% versus 44.4%, respectively. In total, 36 patients had a non-culprit lesion with MaxLCBI4mm ≥400, and the only significant difference in baseline characteristics between patients with and without a non-culprit MaxLCBI4mm ≥400 was high-density lipoprotein (HDL) levels, which were lower in the group with a non-culprit MaxLCBI4mm ≥400 (p value=0.04). Furthermore, 13 patients had a non-culprit segment with a MaxPB ≥70%, and there were no significant baseline differences between the group with and without a non-culprit MaxPB ≥70%. In total, eight patients had a non-culprit lesions with both MaxLCBI4mm ≥400 and MaxPB ≥70%. During a mean follow-up time of 1076±483 days, MACCE occurred in 19 (13.2%) patients, and these were comprised of all-cause mortality: 10 events (52.6%), ACS requiring revascularisation: 7 events (36.8%) and cerebrovascular events: 2 events (10.5%). Of the 10 cases of all-cause mortality, one event was caused by cancer and the remaining nine were cardiovascular deaths.18 The mean time to MACCE was 412±402 days. Using univariable Cox regressions, a non-culprit MaxLCBI4mm ≥400 was significantly associated with future MACCE (univariable HR 2.91, 95% CI 1.18–7.17, p=0.020) and the Kaplan Meier failure estimates, stratified by MaxLCBI4mm ≥400, are presented in figure 2A. The adjusted multivariable Cox regression showed a similarly significant association with MACCE (multivariable HR 3.67, 95% CI 1.46 to 9.23, p=0.006). A non-culprit LCBI ≥65 was also significantly associated with MACCE (univariable HR 2.93, 95% CI 1.05 to 8.13, p=0.039) and the Kaplan Meier curve is presented in figure 2B. This association remained consistent after adjustments in the multivariable Cox regression (multivariable HR 3.08, 95% CI 1.11 to 8.56, p=0.031). There was no significant association between a non-culprit MaxPB ≥70% and MACCE (univariable HR 0.62, 95% CI 0.08 to 4.65, p=0.64, multivariable HR 0.61 95% CI 0.08 to 4.59, p=0.63), nor was there any significant association between the eight patients with non-culprit lesions containing both MaxLCBI4mm ≥400 and MaxPB ≥70% and MACCE during follow-up (univariable HR 0.046, 95% CI 0.0 to 250.3, p=0.48). (A) Kaplan-Meier estimates of MACCE in patients with a non-culprit MaxLCBI4mm ≥400 and MaxLCBI4mm <400. (B) Kaplan-Meier estimates of MACCE in patients with a non-culprit LCBI ≥65 and LCBI <65. LCBI, lipid core burden index; MACCE, major adverse cardiovascular and cerebrovascular events; MaxLCBI4mm, 4 mm segment with maximum lipid core burden index. As the majority of ACS that required revascularisation during follow-up in this study originated from non-culprit segments not imaged by combined NIRS-IVUS during the index procedure, lesion-level statistical analyses were not feasible to perform. However, in two cases, the forthcoming culprit lesions were investigated at baseline. In the first case, combined NIRS-IVUS detected a lipid-rich lesion (MaxLCBI4mm=573, MaxPB 60%) at the time of the index procedure with no angiographic evidence of stenosis at baseline. An ACS requiring revascularisation developed 107 days from the index procedure, at the specific site of the baseline lipid-rich lesion. In the other case, 258 days from the index procedure, a recurrent ACS requiring revascularisation developed in a segment where combined NIRS-IVUS demonstrated calcification but no lipid at baseline (MaxLCBI4mm=0, MaxPB 45%). The Cox regression analyses of MACCE and different thresholds of MaxLCBI4mm and MaxPB are presented in table 2. In summary, the presence of a MaxLCBI4mm ≥300, MaxLCBI4mm ≥400 and MaxLCBI4mm ≥500 were all significantly associated with an increased risk of MACCE, whereas none of the investigated thresholds of MaxPB showed any significant relationship with MACCE. The sensitivity analyses: (1) encountering only cardiovascular deaths and (2) excluding cerebrovascular event furthermore demonstrated results consistent with the primary endpoint analysis (online supplementary table 1). The median maxLCBI4mm in culprit lesions was significantly higher compared with the median maxLCBI4mm in non-culprit segments (425 vs 74, p<0.001), and the ROC curve analysis found MaxLCBI4mm to accurately discriminate culprit from non-culprit segments (c-statistics: 0.85, 95% CI 0.81 to 0.89) (figure 3a–c). The threshold of MaxLCBI4mm ≥400 accurately classified 85% of the segments with a specificity of 92.9% and sensitivity of 54.5%. Among the subgroup of patients with STEMI, c-statistics was 0.92, 95% CI 0.87 to 0.96, and the threshold of MaxLCBI4mm ≥400 identified the STEMI culprit lesions with a specificity and sensitivity of 91.7% and 71.4%, respectively. ROC curves for discrimination of culprit from non-culprit segments with MaxLCBI4mm in all patients (A), in patients with myocardial infarction (B) and in patients with STEMI only (C). MaxLCBI4mm (4 mm segment with maximum lipid core burden index), ROC, Receiver operating characteristics; STEMI, ST-elevation myocardial infarction. The primary results of this study were that a MaxLCBI4mm ≥400 and LCBI≥65, assessed by NIRS in non-culprit segments of a culprit artery, were significantly associated with patient-level MACCE, whereas the IVUS-derived MaxPB was not. 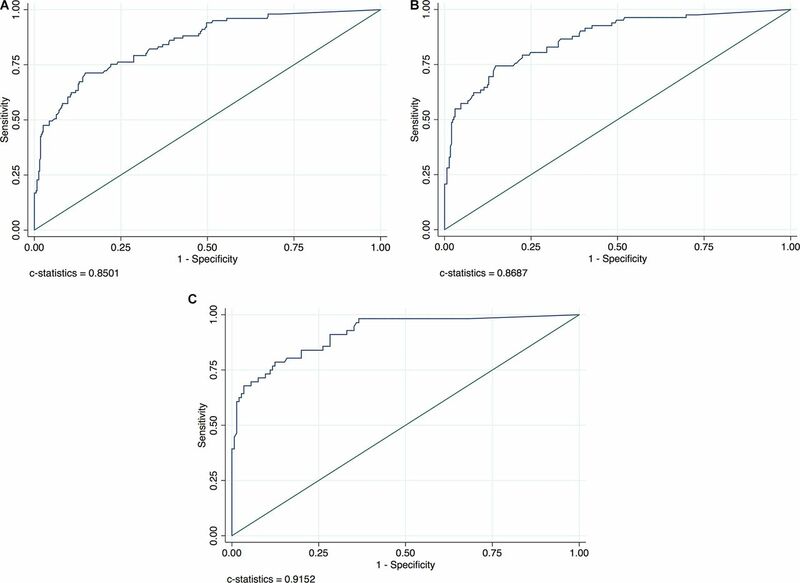 Additionally, this study confirms that NIRS adequately discriminate culprit from non-culprit segments in patients with coronary disease, with the highest specificity and sensitivity among patients with STEMI. As previously discussed, NIRS detects lipids at most culprit sites in patients with ACS and given the assumption that the NIRS-detected signs of lipids are present also prior to the event, NIRS may be able to prospectively detect vulnerable plaques. In this study, intracoronary imaging was performed in the culprit vessel alone and the majority of recurrent ACS occurred in segments not imaged by combined NIRS-IVUS at baseline. Whether a large lipid-rich plaque was present at the time of the index procedure or not is therefore unknown. Nevertheless, the presence of a NIRS-detected MaxLCBI4mm ≥400 within a non-culprit segment of the culprit artery, as well as a non-culprit LCBI ≥ median, was both significantly associated with MACCE, representing a patient-level risk of adverse cardiovascular events identified by NIRS. Previously, reports from the ATHEROREMO-NIRS (Part of the European Collaborative Project on Inflammation and Vascular Wall Remodeling in Atherosclerosis – Intravascular Ultrasound Study [AtheroRemoIVUS])11 14 and ORACLE-NIRS (the lipid cORe plaque association with CLinical events) 13 registries have demonstrated an association between NIRS findings in non-culprit vessels and future patient-level cardiovascular events. Moreover, Madder et al 12 reported the association between NIRS-detected lipid-rich lesions in non-stented sites of a target coronary artery and patient-level MACCE, similarly to this study. ur concurrent results with these prior studies, now demonstrated in a two-centre design, support and substantiate the proposed ability of NIRS to identify vulnerable patients. The primary NIRS and IVUS findings analysed in this study were a non-culprit LCBI ≥ median, MaxLCBI4mm ≥400 and MaxPB ≥70%. The sensitivity analyses however included additional thresholds of both MaxLCBI4mm and MaxPB. There was a numerical increase in the rate of events with higher thresholds of MaxLCBI4mm, except for MaxLCBI4mm ≥600, which was present only in two patients. The HRs however did not increase with higher thresholds of MaxLCBI4mm. Our findings suggest that the presence of a NIRS-detected lipid-rich lesion is a risk marker associated with a higher risk of adverse outcome. What threshold that best predicts future cardiovascular events however still warrants further investigation. In our study, as well as in the previous study by Madder et al,12 the IVUS-derived non-culprit MaxPB was not associated with adverse outcome, and there are a few possible explanations as to why no such association was found. First, this study included IVUS imaging of the culprit vessel alone, in contrast to previous IVUS-studies that performed three-vessel IVUS imaging,2–4 and the number of patients with MaxPB ≥70% was consequently low. Moreover, the non-blinded use of IVUS-guidance during the index procedure and the beforehand known risk associated with a non-culprit plaque burden ≥70% could also have contributed to the low number of patients and events, which furthermore made statistical analyses uncertain. Baseline characteristics were similar between the compared groups in this study. However, an interesting difference in HDL levels was noted between individuals with and without a non-culprit MaxLCBI4mm ≥400, with lower HDL levels among patients with a MaxLCBI4mm ≥400. This finding is in concordance with the proposed antiatherogenic properties held by HDL.19 20 However, no corresponding difference was detected in levels of low-density lipoprotein (LDL) cholesterol.21 In alignment with these findings, a recent study by Honda et al 22 concluded that change in HDL-levels are inversely associated with the change in coronary plaque lipid burden as assessed by NIRS, whereas no association to LDL levels was found. The association between NIRS findings and HDL levels and its potential clinical importance need further investigation in future studies. Despite the promising results of NIRS, several lesions with MaxLCBI4mm ≥400 did not cause a future cardiovascular event during the follow-up time in this study, and secondary preventive medication is still the gold standard in treating non-culprit lesions without flow-limiting stenosis. However, one of the large lipid accumulations with MaxLCBI4mm ≥400 detected at the index procedure did cause an ACS during follow-up. This observation sustains the hypothesis that NIRS may be valuable in the search for the vulnerable plaques, even though the limited sample size with imaging of the culprit vessel alone in this study only allow for hypotheses. If combined NIRS-IVUS imaging can predict both patients and plaques at higher risk of future cardiovascular events is currently tested in the large ongoing Lipid-Rich Plaque study (ClinicalTrials.gov NCT02033694) and the PROSPECT II trial (ClinicalTrials.gov NCT02171065) and if local treatment of non-flow limiting high risk plaques is effective will be evaluated in the randomised PROSPECT ABSORB substudy. Complete intravascular imaging of all three coronary arteries and the combination of additional intravascular imaging modalities could possibly also help discriminate the vulnerable plaques. This study holds limitations in need of consideration. First, this was an observational study of retrospectively enrolled patients, and the decision to perform combined NIRS-IVUS was made by the treating physician. Although consecutive patients were included and prospectively followed, the study population may represent a selected population suitable for intravascular imaging. Second, although the NIRS-IVUS analysis was performed in a routine manner, blinded to the outcome and with standardised definitions, a user-dependent variation may have affected the results. Finally, even though this study included patients from two centres and represents the largest study yet to demonstrate the association between NIRS findings in non-culprit segments of the culprit artery and adverse outcome, the sample size was limited, and future larger studies are warranted to confirm our results and to investigate the ability of combined NIRS-IVUS imaging to identify high-risk patients and vulnerable plaques. In conclusion, this study demonstrates that a MaxLCBI4mm ≥400 and LCBI ≥ median, assessed by NIRS in non-culprit segments of a culprit artery, are significantly and independently associated with patient-level MACCE. NIRS also held the capacity to accurately differentiate culprit from non-culprit segments among patients with coronary artery disease. These results support previous knowledge regarding the ability of NIRS to identify patients at risk for future cardiovascular events, but larger prospective trials are needed to confirm our findings and to evaluate the ability of combined NIRS-IVUS to prospectivly detect vulnerable plaques at risk of future events. The authors would like to thank the staff members at the participating coronary care units for their help throughout this study.
. ESC/EACTS guidelines on myocardial revascularization. EuroIntervention 2014;2015:1024–94.
. 2017 Cardiovascular and stroke endpoint definitions for clinical trials. J Am Coll Cardiol 2017;2018:1021–34. Contributors DE contributed with the study design, patient enrolment, data collection, revised the draft paper and is the overall responsible author for this study. SK contributed with the study design, cleaned and analysed the data including imaging and statistical analyses and drafted and revised the manuscript. EA contributed with the study design, cleaned and analysed the data including imaging analyses and revised the draft paper. KF analysed the data including imaging and statistical analyses and drafted and revised the manuscript. PA contributed to the study design and statistical plan and revised the draft paper. JP contributed with study design, patient enrolment, data collection and revised the draft paper. Funding This work was supported by The Swedish Heart and Lung Foundation, Swedish Scientific Research Council, Knut and Alice Wallenbergs Foundation, Stockholm County Council ALF project (20140076/20150422) and postdoctoral appointment (20130339).